Lock in a great price for Trezzini Palace Boutique Hotel – rated 9.5 by recent guests! The bed was amazing (yes like a cloud)! The location and room and huge tub and bathroom were amazing. Also the reception staff and concierge were helpful. The greeting champagne was a nice touch. Beautiful rooms! It's like a mini palace, the detailing are exquisite. Such a beautiful boutique hotel. Room interior decoration was emperor style in good way. Good view to Neva. Spacious room. Room was so spacious with high quality amenities. All staff were extreemly helpful and friendly. Excellent breakfast. Very nice hotel with beautiful rooms, windows isolate well from the street noise. But the most important thing: My partner had an acciddent during the stay and we have gotten very much willingly and friendly help from the Staff. Without their help we would not be able to come back. Thank you Kirill and All of You! The rooms are magnificent and very chic. The staff are very engaging, friendly and helpful. English speaking, perfect welcome, glass of fizz, chocolate truffles on reception, very welcoming and helpful, The room was beautiful, everything extremely luxurious!!!!! So glad I choose this hotel, it made my stay in st Petersburg memorable!!!! Trezzini Palace Boutique Hotel This rating is a reflection of how the property compares to the industry standard when it comes to price, facilities and services available. It's based on a self-evaluation by the property. Use this rating to help choose your stay! One of our top picks in Saint Petersburg.Located 12 minutes' walk from the Kunstkamera Museum in Saint Peterburg city, Trezzini Palace Hotel features antique-style design and free Wi-Fi. The St. Isaac's Cathedral is 15 minutes' walk away. Set on Vasilevsky Island, Trezzini Hotel provides quick access to such attractions, as the Old Stock Exchange and Rostral Columns are 0.9 mi away. Dvortsovaya Ploshchad Square with the Hermitage Museum are 10 minutes' drive from the property. Elegant rooms at Trezzini include antique-style interiors and a flat-screen TV. Bathrooms come with heated floors and bidet or hygienic shower. European specialties, as well as Russian cuisine, are served in Trezzini's restaurant, and cocktails are offered at the bar. Vasilyeostrovskaya Metro Station is 0.6 mi from Trezzini Palace Hotel. A shuttle service to Pulkovo Airport (12 mi) is provided upon request. When would you like to stay at Trezzini Palace Boutique Hotel? This individually decorated suite offers a seating area and Neva view. Spacious antique-style suite with a flat-screen TV. This suite features a living room and a view of the Neva River and Saint Isaac's Cathedral. This suite offers a view of the Neva River and consists of a bedroom, living room and bathroom. Each suite has individual design. Spacious elegant suite with a flat-screen TV. This suite features air conditioning, a seating area and slippers. This apartment features air conditioning and a view of the Neva River and the Saint Isaac's Cathedral. This suite is decorated in unique style and offers a spacious outdoor terrace. This apartment features a balcony, seating area and soundproofing. An architect Domenico Trezzini lived and worked here. 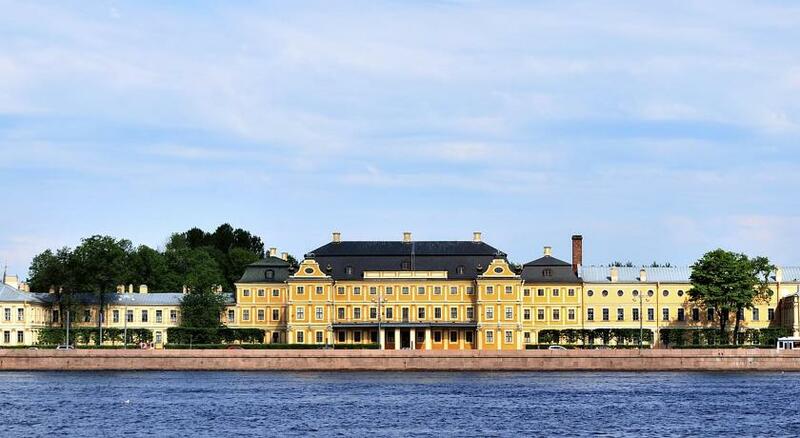 Trezzini Palace Hotel is a reflection of the imperial St. Petersburg, with its nobleness, daintiness and solemnity. Trezzini Palace is a museum which preserved the spirit and hospitality of Petrine epoch. The building was constructed in the XVIII century upon the design developed by one of the main architects of St. Petersburg – Domenico Trezzini. Hotel surroundings – This neighborhood is a great choice for travelers interested in riverside walks, culture and sightseeing – Check location Excellent location – show map Guests loved walking around the neighborhood! House Rules Trezzini Palace Boutique Hotel takes special requests – add in the next step! Any additional older children or adults are charged RUB 5000 per night for extra beds. Trezzini Palace Boutique Hotel accepts these cards and reserves the right to temporarily hold an amount prior to arrival. Please note that the hotel requires a deposit for additional services in the amount of 10000 RUB (credit card only) per room per stay. Please note when booking 4 rooms and more different policies may apply. Please contact property for me details. No lounge, no bar, the view was not nice and location was average. The room was large. Lots of wardrobe space. At night they put chocolates next to the bed it was a touch. The door man was very helpful. Lots of bottled water in the room. I specifically booked a room the Neva view. When we arrived, they gave us another room, 41. It has a terrace with a blank wall. The staff suggested changing the number in a few hours, but we couldn’t wait any longer. Breakfast is pretty standard. I can't say that it somehow impressed me. What I would suggested to the hotel - put the names of the dishes. Foreigners came to breakfast and didn't quite understand what they saw before them. I definitely appreciated the welcome at the hotel. Glass of champagne and handmade chocolates. Also a pleasant bedtime ritual. There was a feeling that the room was recently renovated. You could catch a slight smell of fresh paint. The only thing needing some slight improvement is the WiFi coverage in the hotel - we had some frequent drop outs. Great breakfast. Most of the sights within 30 - 40 mins walking distance. Extremely helpful and friendly staff. Stunning place, excellent location. Nothing was too much trouble. There is not much that could be criticized. Maybe the light switch system was not that clear and it took some time to figure it out. Wonderfully restored palace - spacy rooms - opulent decors - great reception - very friendly staff. We felt very comfortable. The reason for my visit was a business appointment with some sightseeing. The very central location near the Winter Palace was ideal. We were surprised with "No service/negative" attitude of the waiter "Valentin". Sorry, we mentioned his name, because it is not fear for this place & the rest of the staff.. All of them did a really great job and made our stay daily very cosy & comfortable. Quite, clean & very beautiful room. Thank you. Reception & Concierge, Room service, housekeeping do everything to make your stay very comfortable. Perfect service - a place to fell like at home! A la carte breakfast is very good. The next day we had to leave the hotel early to catch an early flight, so the hotel delivered breakfast to the hotel room without extra charge. Very good service. No bar for a pre dinner or evening drink and conversation. Great location. Absolutely beautiful Russian style rooms. Perfect hospitality.